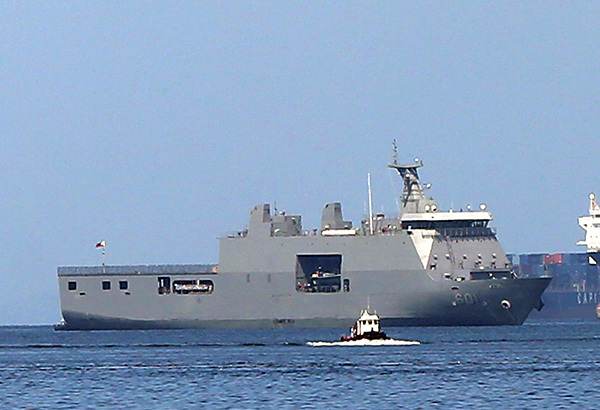 MANILA (PNA) --- The newly-arrived BRP Tarlac (LD-601) will be assigned to the Philippine Fleet's Sealift Amphibious Force. 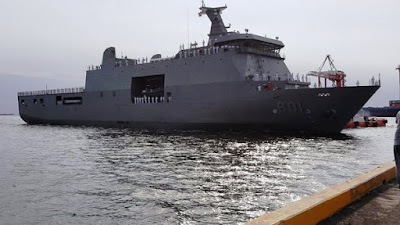 This was disclosed by Philippine Fleet commander Rear Admiral Ronald Joseph Mercado Monday as the country's first strategic sealift vessel (SSV) was formally welcomed at Pier 13, Manila South Harbor Monday afternoon. 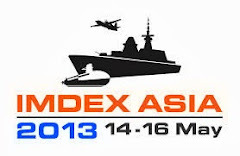 Mercado said the Filipino SSV was patterned after the Indonesian Makassar-class landing platform dock. Her sister-ship is expected to be delivered by May 2017. The ship has a complement of 121 officers and enlisted personnel. She can carry 500 troops, two rigid-hull inflatable boats, two landing craft units and three helicopters. BRP Tarlac has a tonnage of 7,300 tons, overall length of 120 meters, breadth of 21 meters, draft of five meters and carry a payload of 2,800 tons. 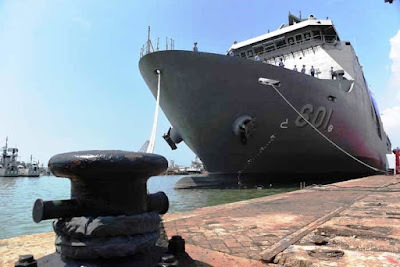 MANILA (PNA) -- Pending the country's acquisition of an aircraft or helicopter carrier, the newly-arrived BRP Tarlac (LD-601) is currently the Philippine Navy (PN)'s largest commissioned ship. The latter is one of the two strategic sealift vessels (SSVs) ordered from Indonesian shipbuilder PT PAL (Persero) for PHP3,870,000,000. The BRP Tarlac anchored off the breakwater of Manila South Harbor midnight of May 14 exactly four days later after leaving the PT PAL (Persero)'s shipyard in Surabaya last May 9. Her distinction as the PN's largest vessel ever was confirmed by Defense undersecretary for veterans affairs and retired Navy flag-officer-in-command Vice Admiral Jesus Millan in a message to the PNA Monday. "(As former PN head) personally I could say that for the transport category this Tarlac class vessel is the biggest now because it has a standard load capacity of 7,200 tons versus the landing ship vessel or Bacolod City class of 4,265 tons," he added. Millan is the PN's 34th flag-officer-in-command. He assumed command of the Navy in April 30, 2014. He retired on Aug. 10, 2015, turning over his post to Vice Admiral Caesar Taccad. The PN operate two ships of the Bacolod City class and these were commissioned in Dec. 1, 1993. The two ships in the class are named BRP Dagupan City (LCC-551) and BRP Bacolod City (LCC-550). 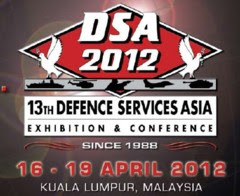 Millan said the SSVs are a multi-role vessel and very useful for humanitarian and disaster relief missions and can be transformed to a floating government center if required.